Team 'For Ahkeem'! hasn't added a story. We are the film team behind the documentary, For Ahkeem, which follows St. Louis teenager Daje Shelton as she comes of age in the wake of Ferguson and Black Lives Matter. We've been following her since she was sixteen, and it's been thrilling to watch Daje grow into a remarkable young woman and mother. In the coming months, Daje will begin classes at St. Louis Community College, Forest Park in the Diagnostic Sonography program to pursue her dream of becoming an ultrasound technician, and we could not be more proud! As the film hits festivals all over the world, we're raising money to support Daje and her young family as she takes this next big step. Please join us in celebrating her resilience and perseverance, and help her start this new chapter with wind in her sails! 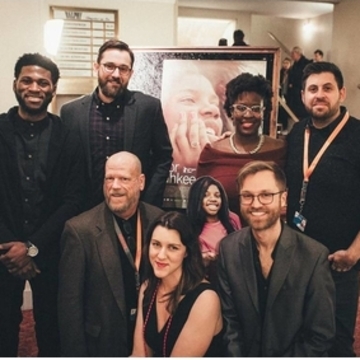 About the film: For Ahkeem has been made over the last five years alongside Daje and her family, and had its international premier at the Berlin Film Festival in Germany. We're just kicking off our US festival tour this April and May with Tribeca Film Festival, then on to HotDocs in Toronto, Boston Independent Film Fest, Florida Film Fest, the Montclair International Film Festival (and many more TBA!). We'll be raising funds for Daje throughout the festival tour and invite our audiences to contribute to helping Daje have a successful launch of her college career. Daje and her family truly mean the world to us, and we're humbled to have this opportunity to celebrate her growth and help her keep moving forward! Our filmmaking team has kicked things off with an initial contribution of $1,500, and we need your help to get to 10K to ensure she's able to succeed. JOIN US! Team 'For Ahkeem'! hasn't posted any updates yet.